Antagonistic pseudomonas fluorescens is a microbe with high antibiosis potentia. It enters the plant vascular system, and reaches the various parts of the plant system and acts as systemic bio-control agent against various fungal and bacterial diseases such as Pythium spp., Phytophtora spp., Rhizoctonia solani, Fusarium spp, Botrytis cinerea, Sclerotium spp., Sclerotinia sp. and Ustilogo spp. It is suitable for plants like Tomatoes, Chilli, Cut flowers, Orchards, Vineyards Ornamentals, Potato, Cucumbers and Eggplant. At GreenMax AgroTech, with the facility of large scale fermenters, we are capable to produce about 10 tonnes of high quality Pseudomonas fluorescens. 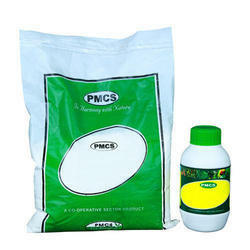 The product is available in carrier based and liquid formulation. Mother culture of Pseudomonas fluorescens was sourced from Project Directorate of Biological Control (PDBC), Bangalore. Pseudomonas mass multiplied from pure mother culture under strict aseptic conditions is supplied as liquid and carrier based formulation. While liquid formulation have a minimum population of 1x 109 (CFUs)/ml, carrier formulation has a population of 1x 108 (CFUs)/g. The product is available as liquid formulation and talc carrier based formulation. • Sticking agent – CMC – 1%. Pseudomonas fluorescens are Gram-negative rod shaped aerobic bacteria that inhabit soil, plants, and water surfaces. It is used as a bio-control agent against several plant disease causing pathogens. Pseudomonas fluorescens produces a soluble, green fluorescent pigment pyoverdine which is responsible for chelating iron only when concentrations are low. Pseudomonas fluorescens are commensal species with plants, allowing plants to attain key nutrients, degrading pollutants, and suppressing pathogens via antibiotic productions. Pseudomonas produces secondary metabolites, many extracellular hydrolytic enzymes which supresses plant disease. such as pyrrolnitrin, pyoluteorin, and 2,4-diacetylphloroglucinol inhibit phytopathogen growth. Diseases from Rhizoctonia solani and Pythium ultimum that affect cotton plants are inhibited by this strain. Pseudomonas fluorescens produces hydrogen cyanide and the siderophores pyocheline and pyoverdine which it uses to outcompete with many pathogenic bacteria and suppress pathogens in the rhizosphere. Pseudomonas fluorescens produce exopolysaccharides which are used for protection against bacteriophages or dehydration as well as for defense against the host immune system. Pseudomonas fluorescens possess viscosin which is a peptidolipid that enhances antivirality. For one kg of seeds about 40 grams of Pseudomonas product is required. Mix required quantity of Pseudomonas with equal quantity of Rice gruel .With this mixture, mix the required amount of seeds shade dry and after 24 hours, use the seeds of sowing. Mix 2 Kg of Pseudomonas with 50 lits of water. In this mixture, keep the seedling roots in immersed condition for 10 minutes and use the seedlings for transplantation in the field. Mix about 5 kgs Pseudomonas with 100 kgs of organic manure, keep the mixture under shade for one week and apply to the soil. Looking for Pseudomonas Fluorescens ?